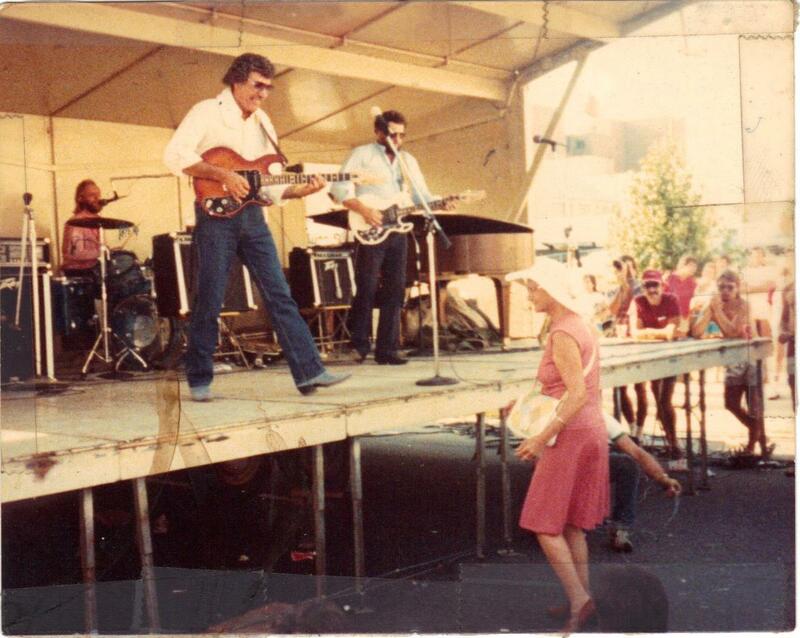 Carl Perkins’ transcendent musical moment on stage in Winston-Salem. Good fiction takes you to places a million miles from the hassles and annoyances of everyday life. Blair’s new title Long Gone Daddies is good fiction. It’s a tale of a struggling band with a conflicted leader. 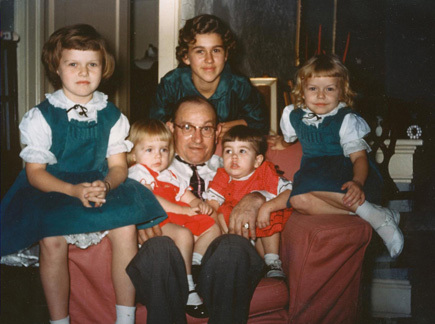 It talks about Carl Perkins, and that took me to a place from my past. The Winston-Salem where I grew up was a different place from the Winston-Salem where I currently live. Back then, the streets were paved with golden tobacco leaves. Well, not quite, but there was a lot of money around. 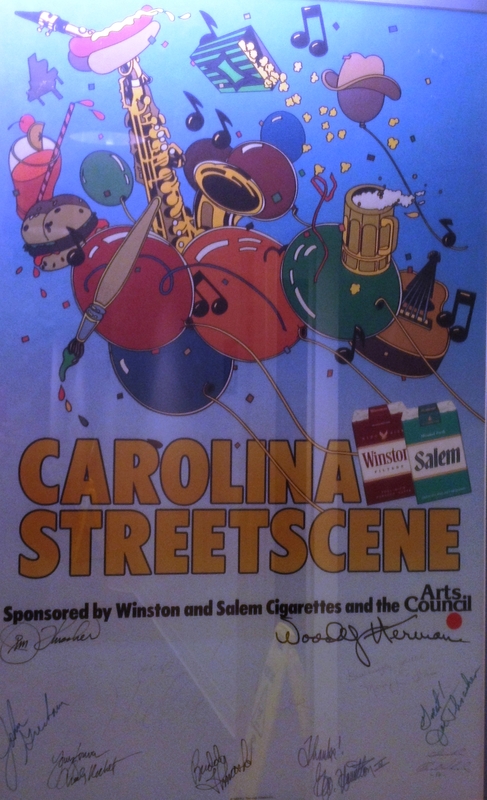 One of the things the money was spent on was a big street festival put on every September by the Arts Council, the Carolina Street Scene. Artists and craftsmen from all over would come to sell their wares. (My parents still drink out of wine goblets purchased there 35 years ago.) The festival also brought in internationally renowned musicians. Some I’ll always regret missing (Mose Allison, Muddy Waters). Others I’ll always cherish getting a chance to see (Dizzy Gillespie, Bo Diddley). I vividly remember seeing Carl Perkins in 1983. I don’t remember how much I knew about Perkins at the time. I probably knew his biggest hit, “Blue Suede Shoes,” and that he was the least famous member of the Million Dollar Quartet. I definitely didn’t know the back story, how he was supposed to be bigger than Elvis but things didn’t quite work out. It didn’t matter. What I saw that September day was a transcendent musical moment. I define transcendent as when someone is doing what he does better than anyone on the planet and having a great time doing it, feeding off the energy of the crowd. 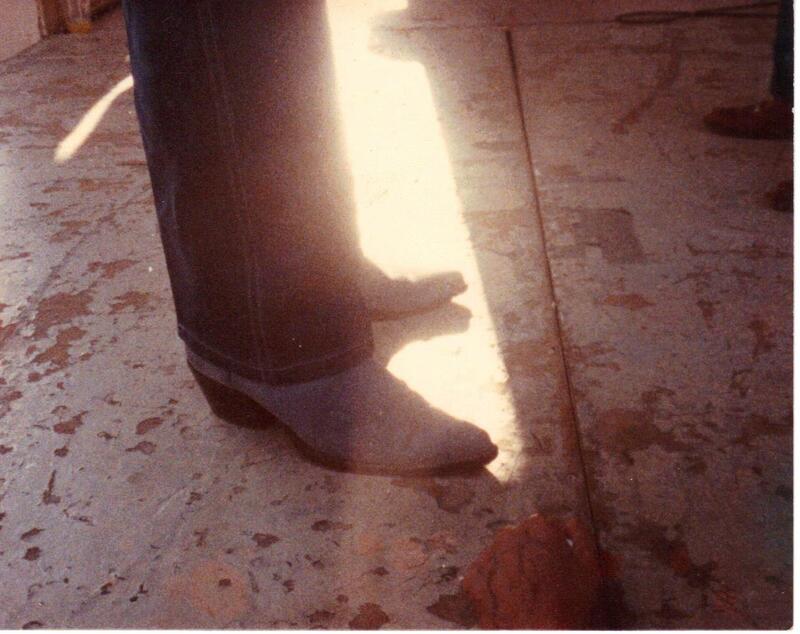 Long Gone Daddies says this about Carl Perkins: “Carl’s guitar, it could power a train. Carl’s guitar could bring the freight.” For one glorious afternoon, I was lucky enough to be standing next to the tracks as the train went by, feeling its power and gazing in awe at it. Perkins was a rock-and-roll messiah. Someone who could make you believe in the power of music, no matter how jaded you were. I’ve seen hundreds of live music shows. I’ve forgotten more acts than I remember. But Perkins really stuck with me—what a great guitar player he was, how much stage presence he had, what a great performer he was. Over the years, music has become less important to me, getting shunted behind other distractions. Long Gone Daddies reminded me of a part of my life I used to really enjoy. It’s been awhile since I’ve seen a transcendent musical moment. I should check the calendar of The Garage (www.the-garage.ws), the local bar where the Drive-By Truckers played all the time before they got famous. Maybe the next big thing is playing there this month. 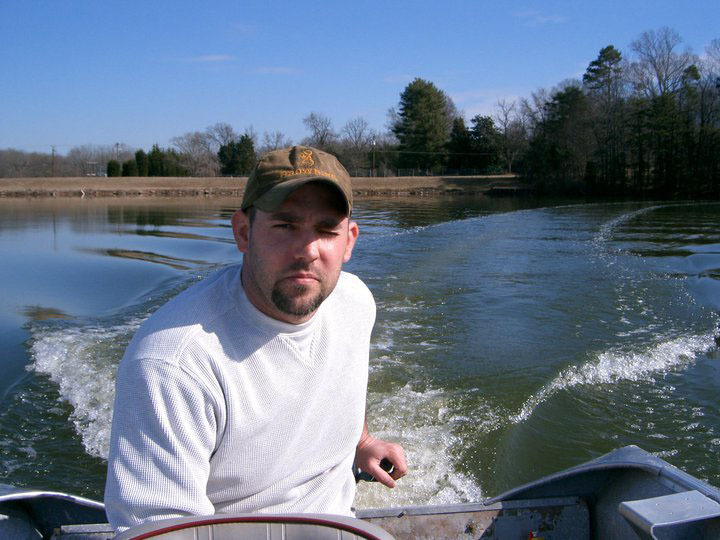 January 2011: Brought home copy of Fishing North Carolina. 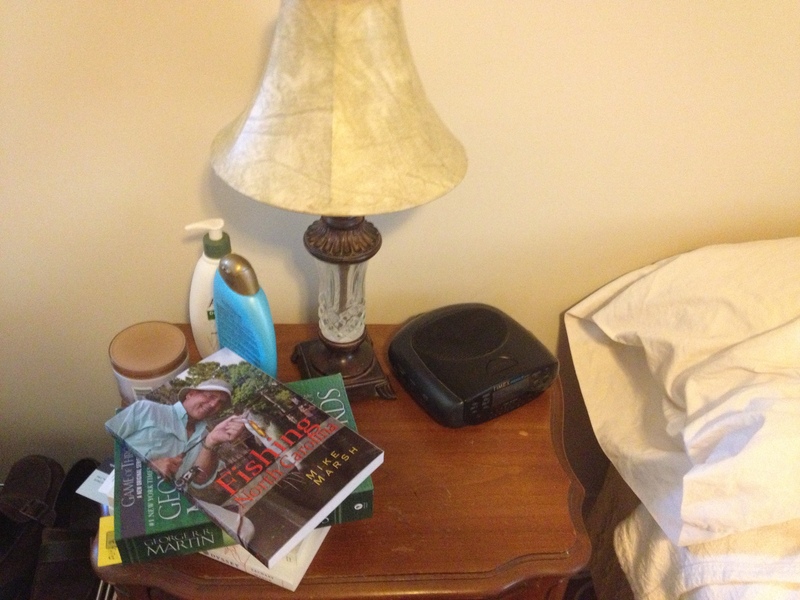 My husband is immediately taken with the book, and I begin to feel like I’m being stalked by Mike Marsh. 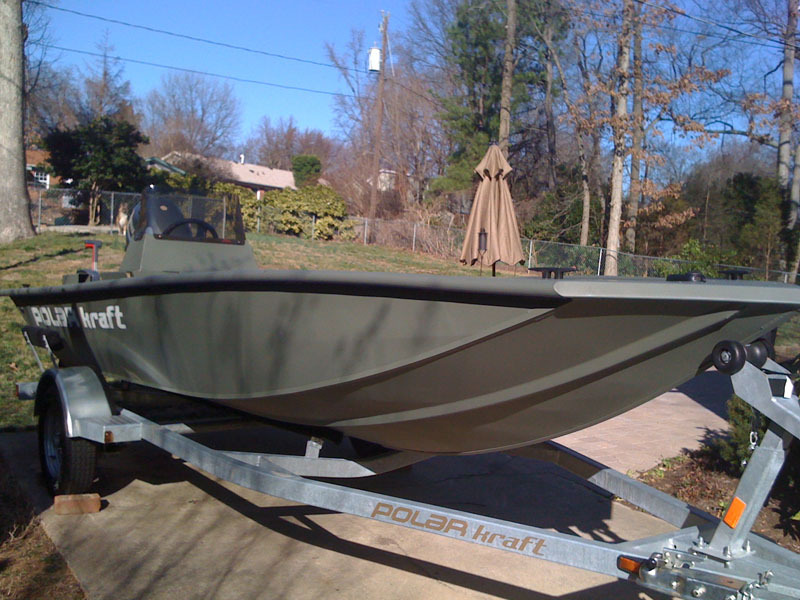 Mid-January 2011: Jeff purchases an inexpensive john boat with bad rivets. 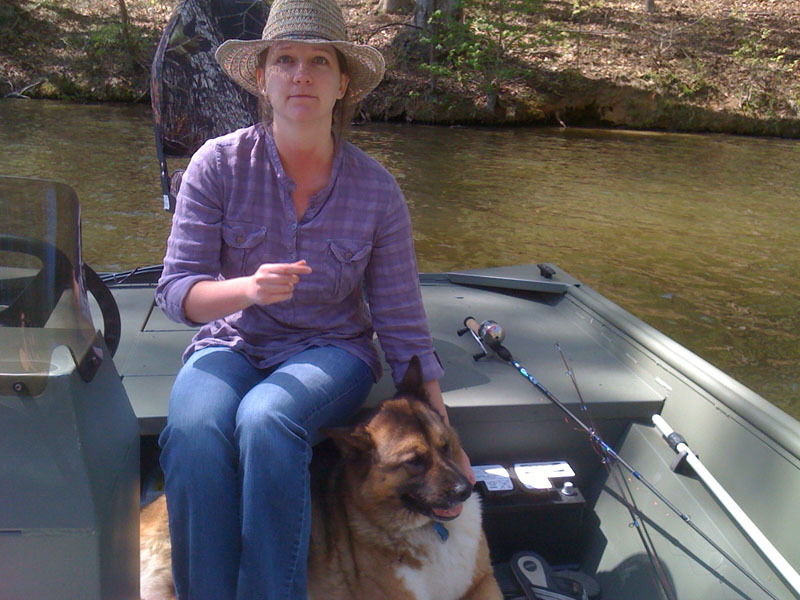 Late January 2011: It is above 50 degrees, so we try out the new boat at Lake Brandt. We’ve known each other since we were in the 7th grade, and I’ve rarely seen Jeff so happy. This is Jeff’s happy face. 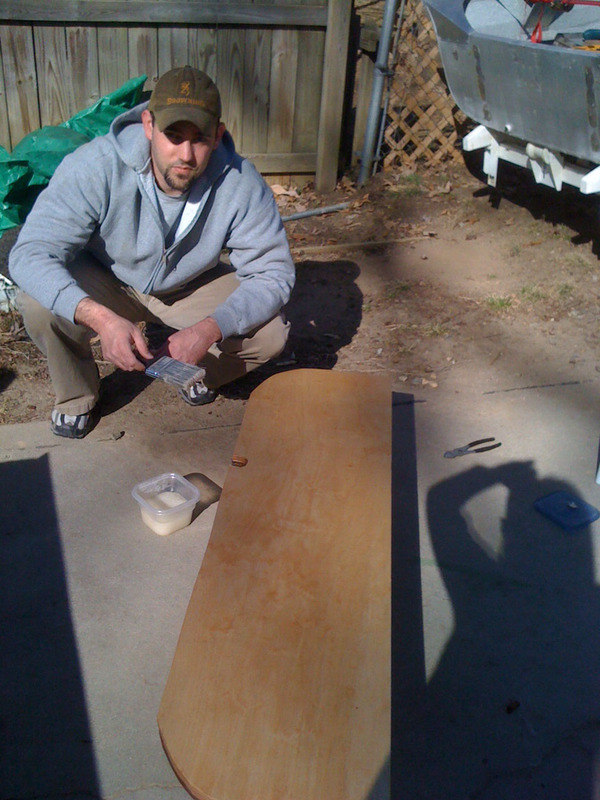 February 2011: Jeff purchases expensive “marine wood” to make new seats for the inexpensive boat. He refuses to paint my seat pink. 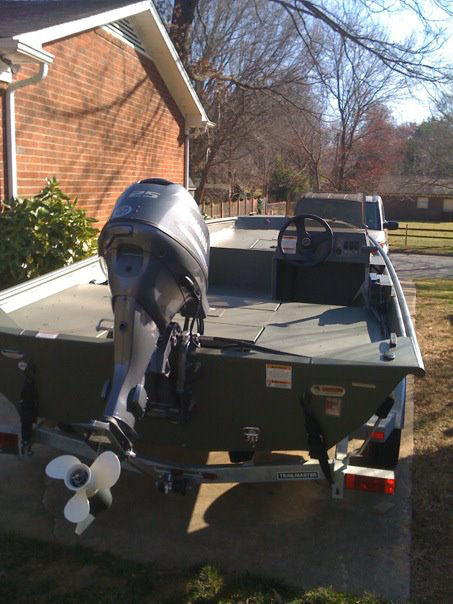 March 2011: Based on information I’ve gleaned from reading Fishing North Carolina and a few of Mike Marsh’s fishing articles in North Carolina Sportsman magazine, I decide to upgrade my fishing lures. 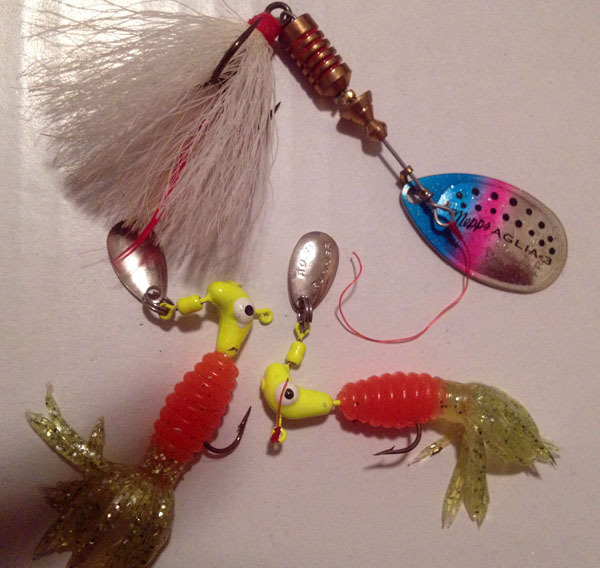 Jeff tells me I will never catch anything with my new lures. 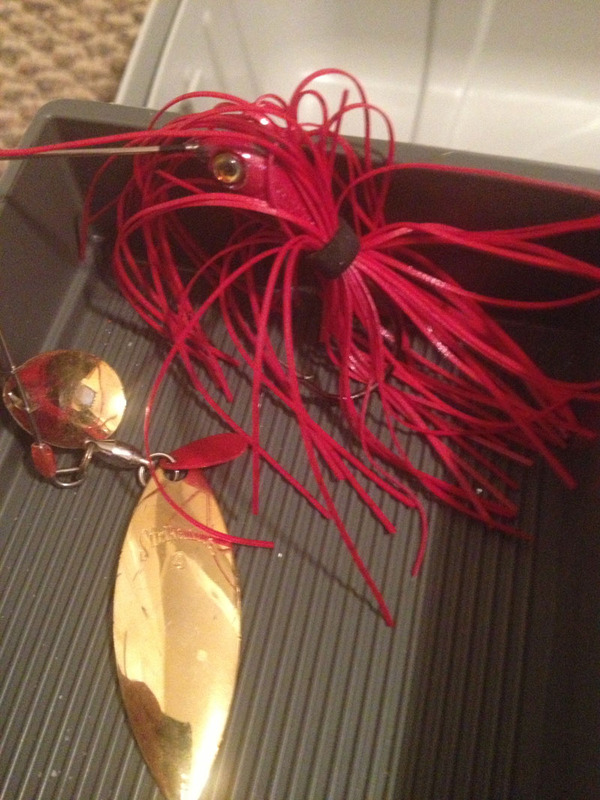 I call this lure my red guy. 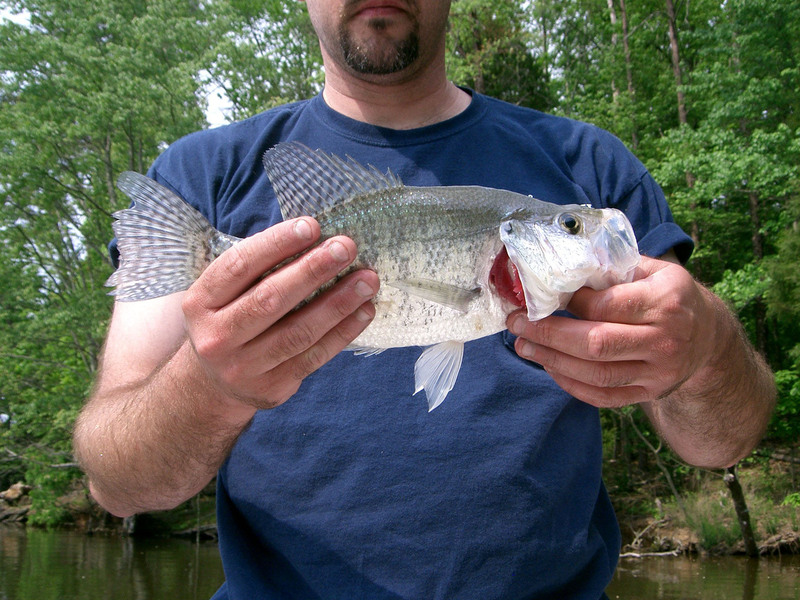 I catch this crappie with my red guy. 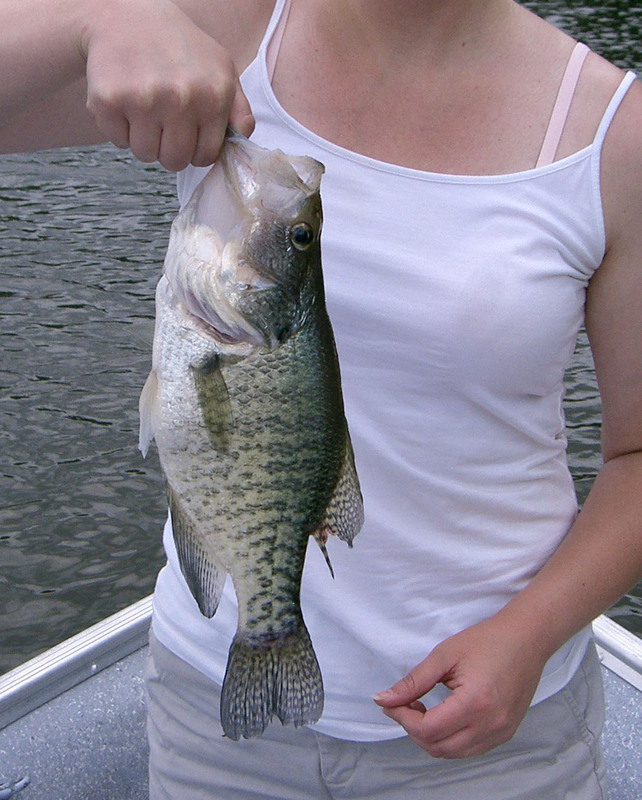 And this crappie . 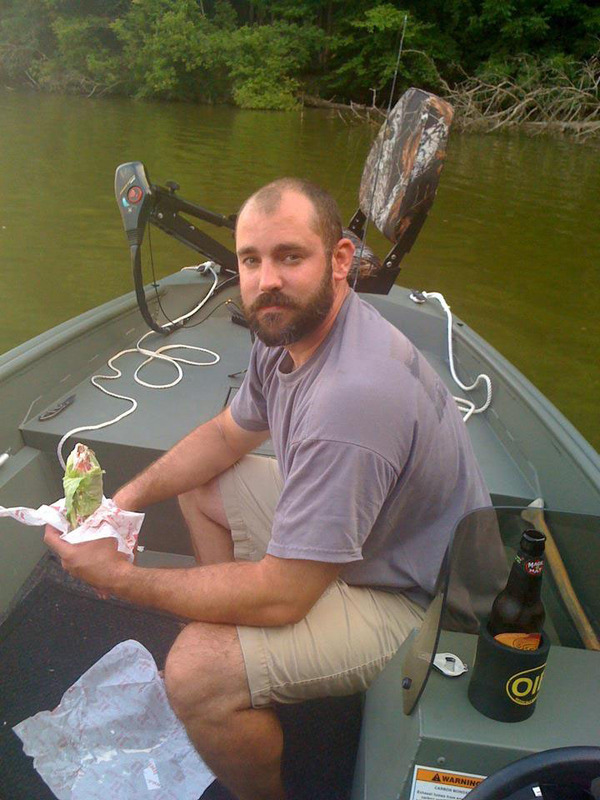 . .
August 2011: I admit that I don’t catch fish with any of these guys. 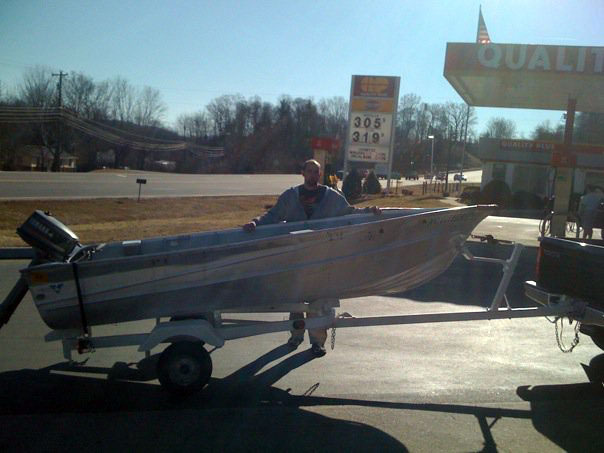 January 2012: Jeff purchases a brand-new boat with good rivets. We both agree that the new boat feels much more like home. April 2012: I am now quoting Bill Dance in regular, every day conversations. 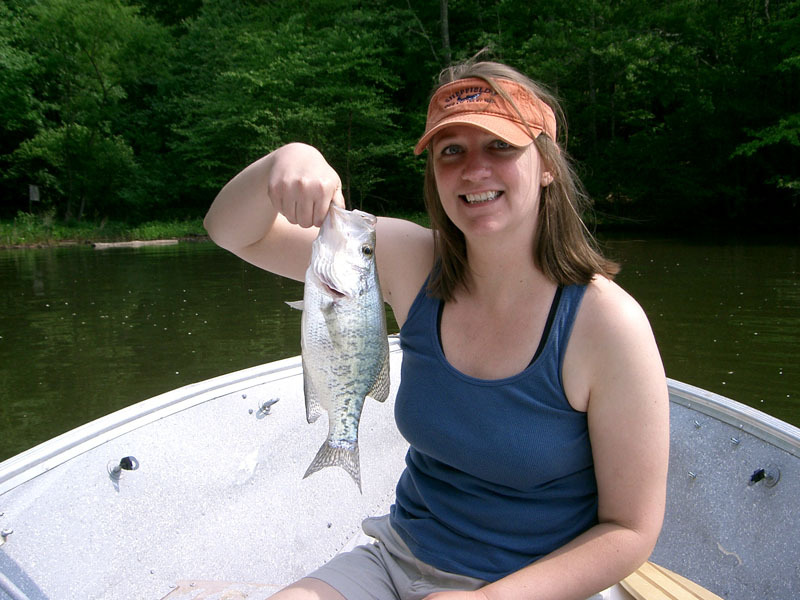 Well, the dogwoods are blooming, and this is my crappie. 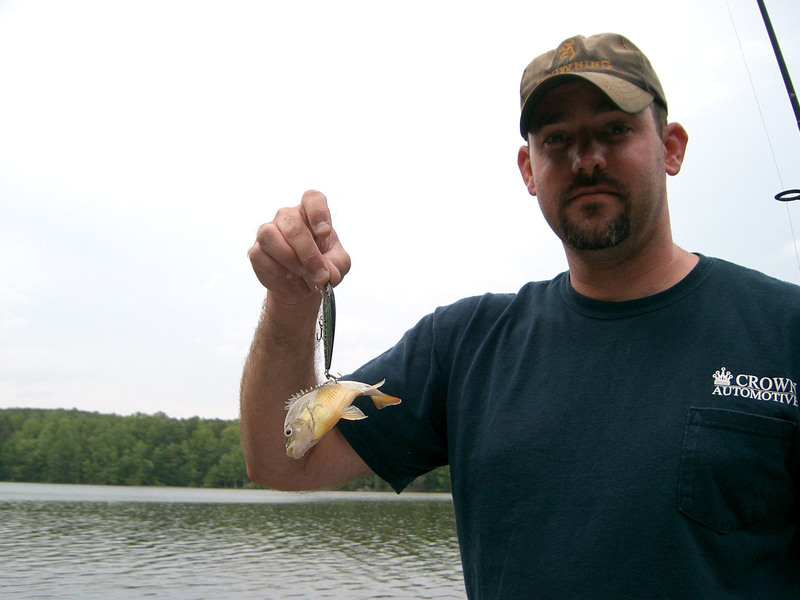 I let Jeff hold my crappie. 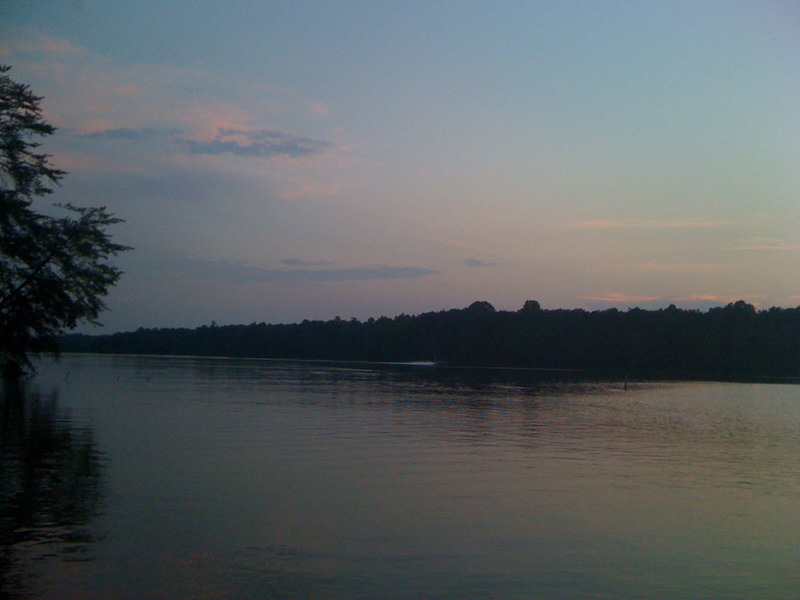 June 2012: Thanks to Fishing North Carolina, we find out that Lake Higgins is open until 11 p.m. on Friday nights all summer long. 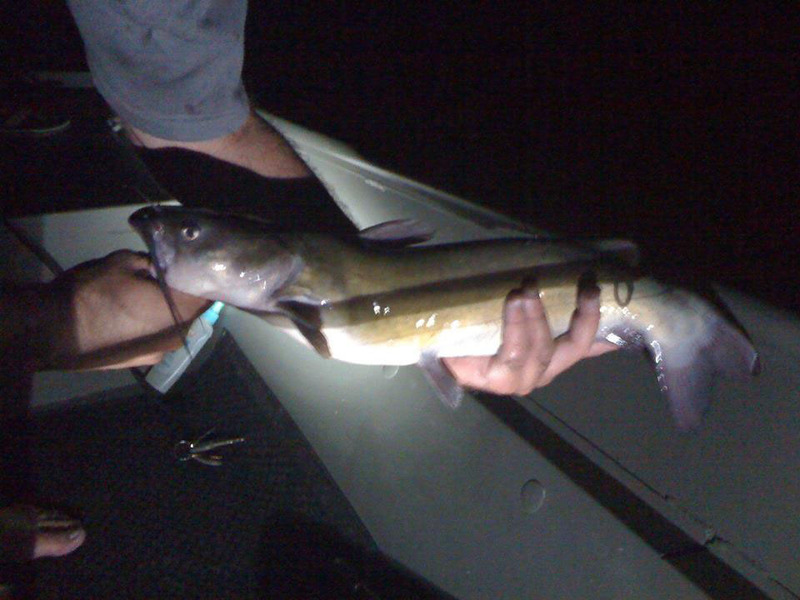 So we go night fishing. 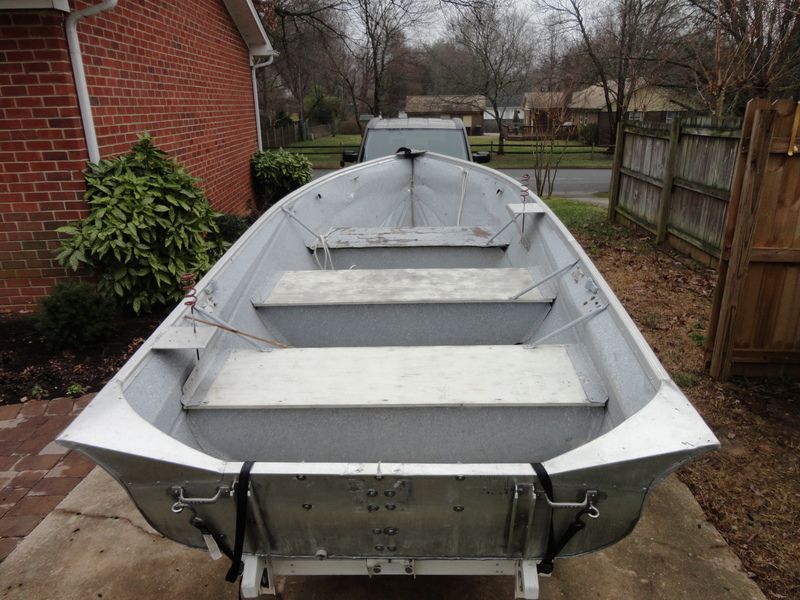 April 2013: A new season of fishing awaits! It’s not too late to purchase your own copy of Fishing North Carolina, available wherever books are sold and at blairpub.com. 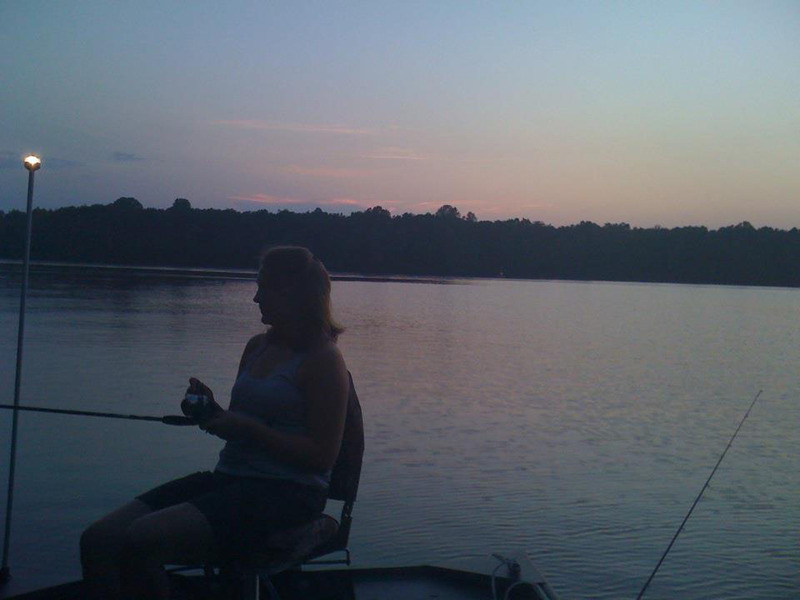 One spring, I went fishing on a beautiful North Carolina urban lake. I cast out a tiny lure, meant to be food for bigger predators. Under water, something crashed into it with force. I was ready for minnows but not a shark. Fighting and swirling through the water was an armor-plated, primordial gar! This fish had a mouth like an alligator. On nature programs, they always clamp the alligator’s mouth shut so I used my hand to do the same. Bad idea! The creature thrashed and sliced grooves in my palm with its razor sharp teeth. 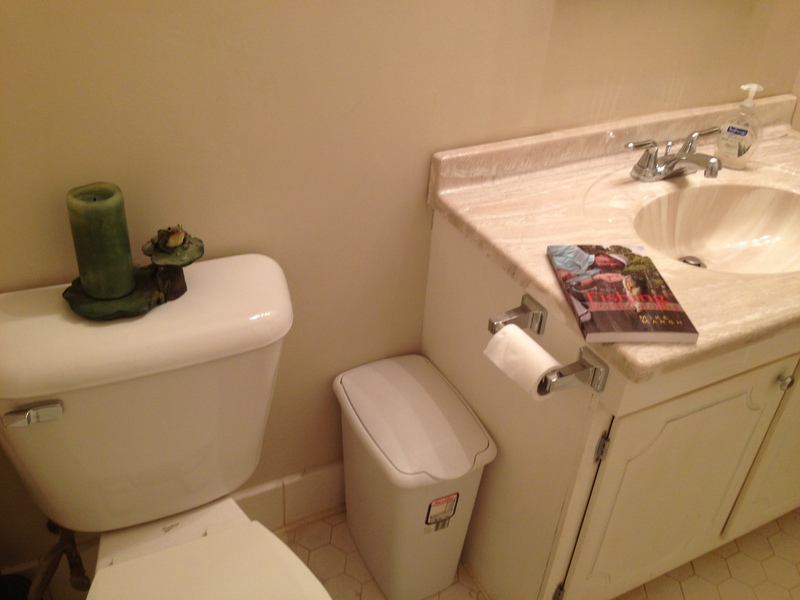 Luckily a friend’s medicine cabinet was a block away. In 20 minutes, the blood had clotted, and I went back to fishing. The gar had freed itself. 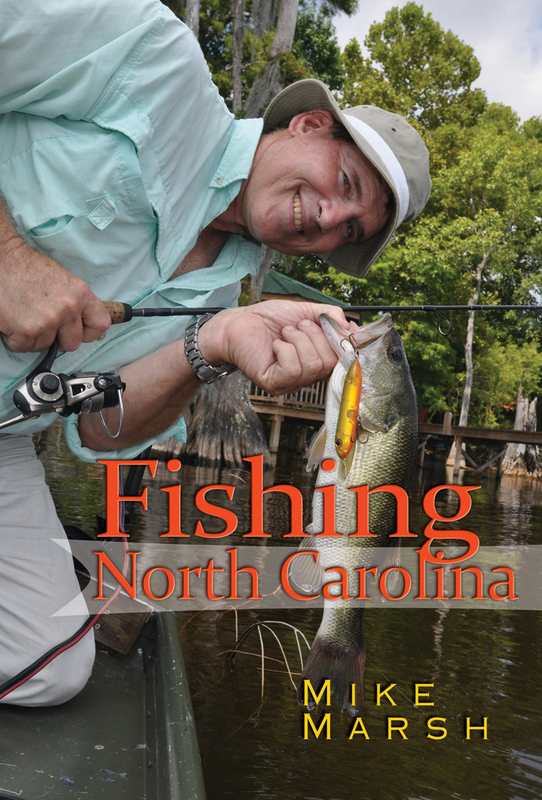 Unfortunately for me, Blair hadn’t yet published Fishing North Carolina, a fishing guide from expert Mike Marsh. 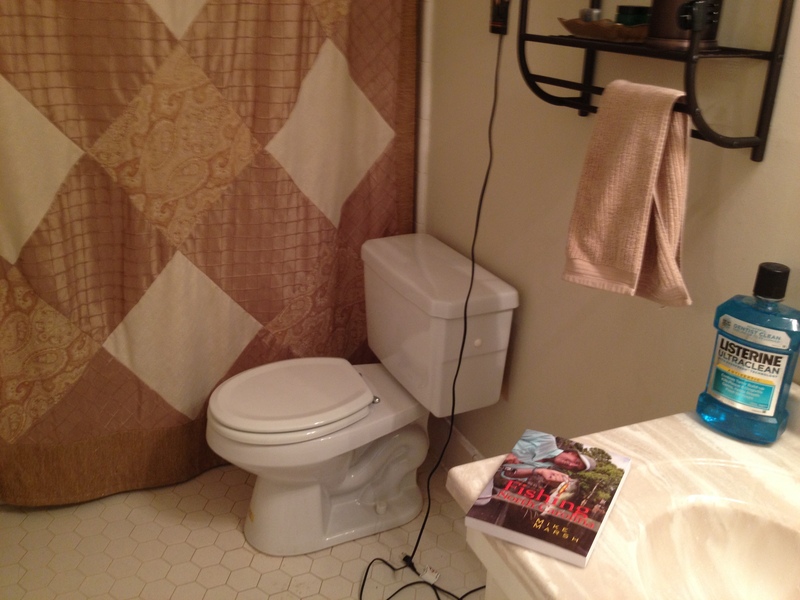 Next time, I’ll be sure to reference this book. For more fishing stories, check out Growing Gills by David Joy and Brook Trout and the Writing Life: The Intermingling of Fishing and Writing in a Novelist’s Life by Craig Nova. Look for another installment of Blair Books in Action next week! I am a North Carolina newbie. I moved down here from the D.C. area with my boyfriend, Travis, a few months ago, and I am truly enjoying living in Winston-Salem and working at Blair. But I didn’t start out that way. Winston-Salem is about a six-hour drive from D.C., and neither Travis nor I was at all familiar with the area or with North Carolina in general. 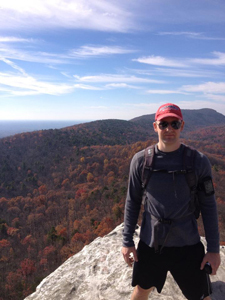 Travis came down a couple of months earlier than I did, and on my visits prior to my own move, he would take me to Winston-Salem attractions, such as Old Salem, Salem Lake, and local hiking trails. I was disappointed to be leaving Northern Virginia, but all of my trips to N.C. were fun, so I was eager and hopeful about the change. But then I got down here, and Travis dropped the ball. 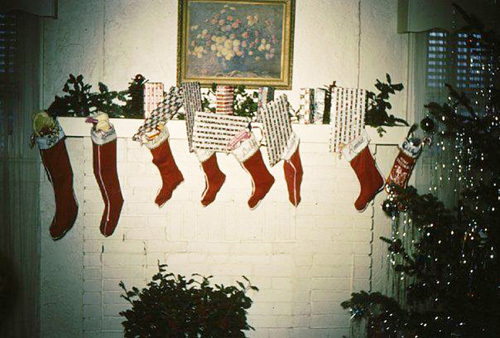 He stopped trying to find fun things for us to do, since he no longer had to sell me on it: I was here. And rather than take any responsibility for the situation or make the effort to entertain myself, I wallowed in my resentment. HE had made this decision for us, and it was up to HIM to make me like it. Fortunately, during this time, one of my first tasks at work was to check e-book conversions of Blair’s backlist titles. I skimmed through a wide offering of books devoted to highlighting attractions and activities in North Carolina and the South in general. Confronted daily with all that the region has to offer, I was robbed of my excuses for complaining. If I chose to be discontent, it was my own fault for not taking advantage of the opportunities around me. So Travis and I started doing the things suggested in Blair books. 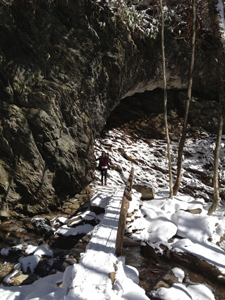 We went hiking (Hiking North Carolina’s Lookout Towers), we tried new restaurants and recipes (Well, Shut My Mouth: The Sweet Potatoes Restaurant Cookbook), and we checked out the local museums (North Carolina Weekends). 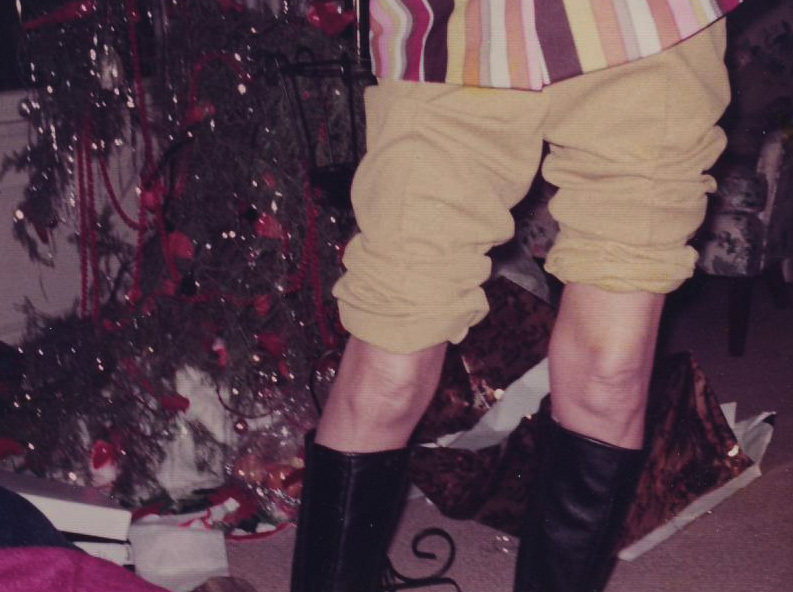 With so many excursions to look forward to, I was far too busy to bemoan the losses I had supposed I suffered. 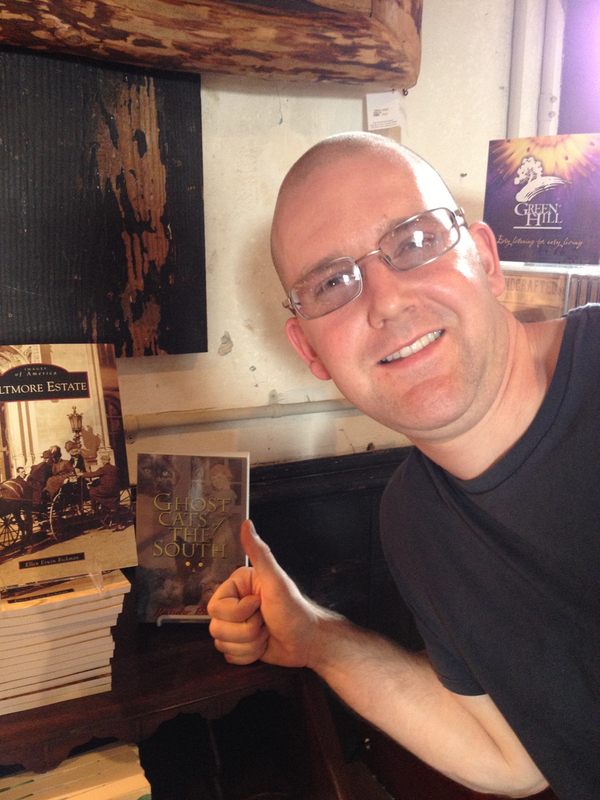 Travis approves of Blair books at Biltmore. 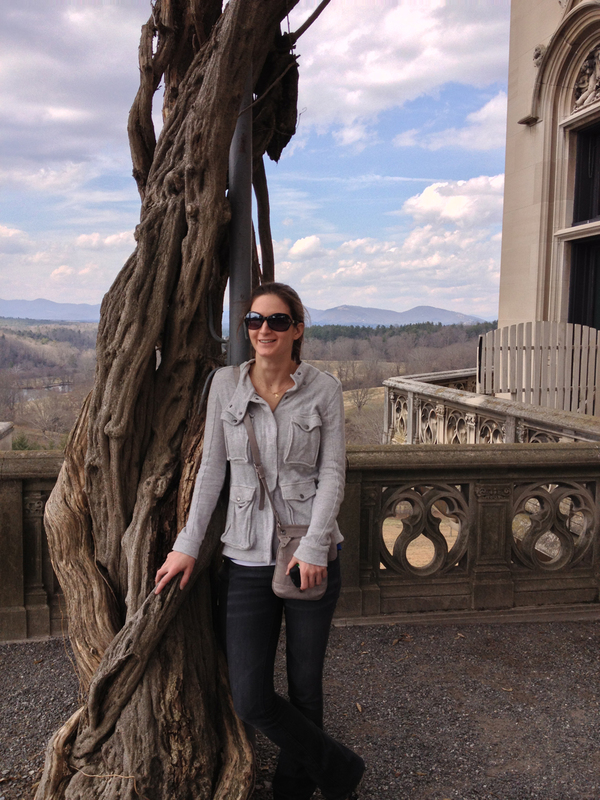 Last weekend, we took the recommendation to visit the Biltmore Estate from Travel North Carolina. I had only heard vaguely of Biltmore, associating the name with expensive hotels. 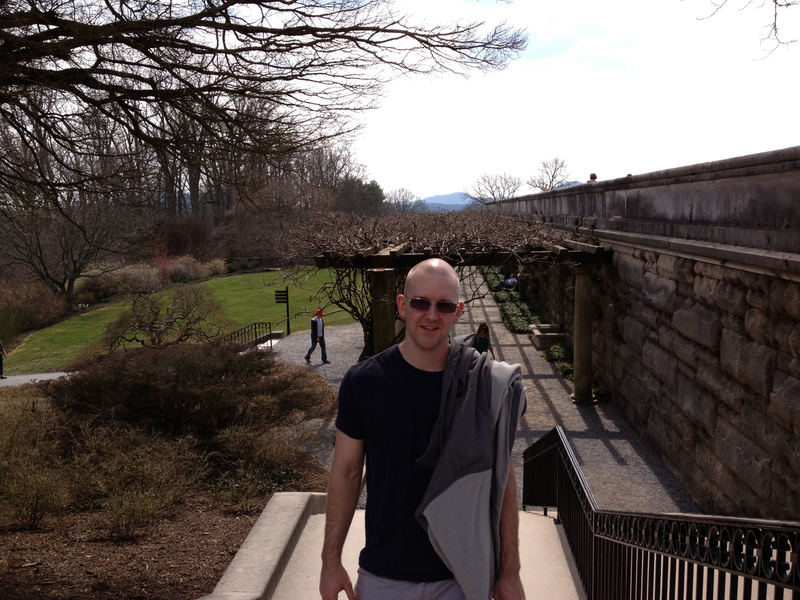 I did not know that it is actually the largest private residence in America, open for visitors, and completely amazing. We ended up spending a total of seven hours within the estate grounds and had not exhausted all of its possibilities. It is definitely worth checking out. 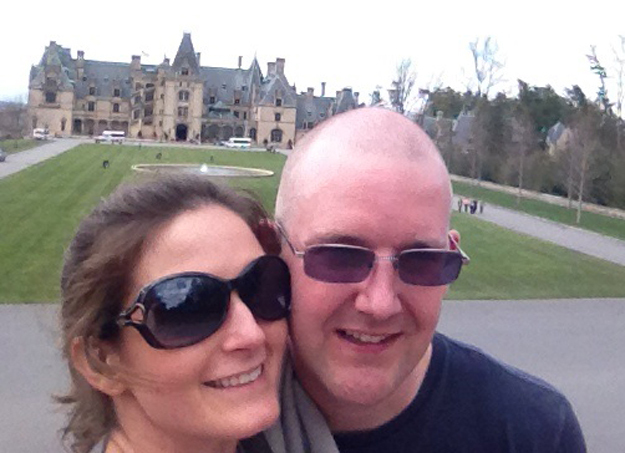 My original aim for this blog was to focus on our trip to Biltmore, but when I examined the true nature of how Travis and I have put Blair books into action, I realized that it has been much bigger than any one trip or outing. 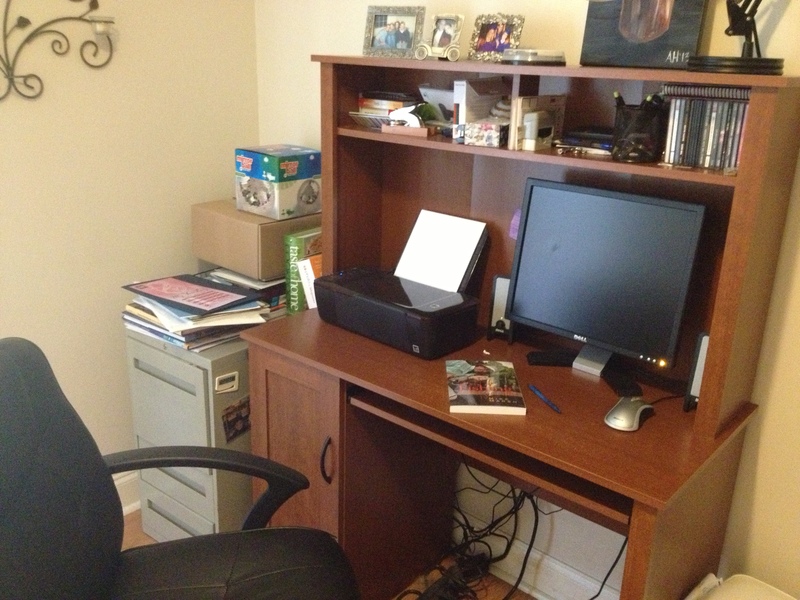 Blair books opened up the possibilities of my new home to me and even made me like it. They not only saved my relationship, but they saved me from myself. Tagged #blairbooksinaction, Biltmore, Hiking North Carolina's Lookout Towers, moving, North Carolina, North Carolina Weekends, relationships, Shannon Pierce, Travel North Carolina, Well Shut My Mouth!